Since the beginning of time, mankind has had both the desire and need for good quality knives. Earlier in history this need was often hunting or protection based. In the beginning knives were usually made of flint or crudely shaped from wood, but as man developed, so did the knife. It was only natural as man discovered and put new metals into use the knife blade was soon made of these fresh materials. History has recorded common man-made knives of flint, copper, bronze, and iron. And, of course, the current use of steel has completely changed knives to the point that they are now not only useful but very high in overall quality. Additionally, as new metals and materials are discovered, who knows what the future holds for the development of the simple knife. Most of us who spend time in the outdoors carry at least one knife and many of us carry more than two. I suggest we all carry a sheath knife along with a pocket knife of some sort, so we have a back up or a knife for special uses. Keep in mind neither the sheath skinning knife nor the pocket knife was designed to do the same jobs. Since I covered the skinning knife in an earlier article, let's look at pocket knives. There are many different types and styles of "pocket" knives on the market today, but I want to discuss the pen knife, jack knife, and multi-purpose knife, all three of which are very common designs. We have all seen them, but do you know the difference and which design is the best one for you? If you are like most outdoors people, you just pick up a knife that happens to attract your eye just as long as it has a good design. But, there is much more to it than simple visual attraction, especially when your life may one day depend on the selected knife. A jack knife is simply hinged at one end, but it may have more than one blade at the hinge (see figure #1). I prefer a jack knife with more than one blade and I carry one as a backup in my survival kit. Of course the blades fold into the handle and the knife is safe to carry, either in your pocket on in a small pocket knife sheath. A jack knife is thought to be the most popular type of pocket knife among backpackers, hunters, fishermen, campers, and the military. The Multi-blade knives (Boy and Girl Scouts knives, Swiss Army knife, and Tool Pocket Kits) are the second most purchased pocketknife design sold today (see figure #2). Usually they have scissors, corkscrew, screwdrivers, can openers, perhaps a wrench, tooth pick, and everything else but the kitchen sink. We have all seen them and I dislike them due to their bulkiness and additional weight. Some of these multi-bladed knives can have dozens of various blades, most of which will never be used in the woods. I know some of these knives are made to very high standards and are of excellent quality, but I still question how that can be with so many attachments. I guess each of us can decide which design is best, but as a frequent backpacker, I refuse to pack weight I cannot benefit from at some point. I want a sharp knife blade, not a tool box. Another knife, the pen knife, is hinged at both ends of the handle (see figure #3) and most have two or three light blades at each end. It is a good knife for those that want more than one type of blade. It was originally designed years ago to cut or shape pen quills that were used in writing at the time. One positive aspect of a pen knife is it is smaller and very light weight when compared to a jack knife, which may vary greatly in size and weight. The pen knife is considered by many to be the third most commonly carried pocket knife in the world today. 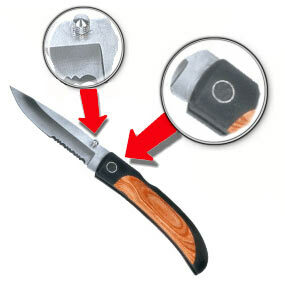 There are variations of these knife designs with such features as locking blades, one handed opening and closing blades, assisted opening blades, and the list goes on and on (see illustration). I suspect the design of the common pocket knife will always be under revision and we will see many changes as new materials are developed in the future. I know that in just the last twenty years or so many new designs have been developed and some older designs improved on. Personally, I think it's great. Now that you know the difference in the basic pocket knife designs, what kind of blade steel should your knife have? Many knife experts consider S30V the best steel on the market for blade construction, but there are many different grades of steel and at different price ranges. I personally prefer a blade of 420HC, which is stainless steel (this only means it is resistant to rust, but it will rust if not properly cared for), takes a good edge and is easy to sharpen. Different blade steel has different hardness ratings and different edge retention considerations, so look around a bit and compare. There are a number of different grinding styles used in making knife blades. The most commonly used (of factory made larger knifes) is the semi-hollow grind, which combines a sharp edge with good dependable blade strength. Also, another good blade grind is the flat grind (or sometimes called the V-grind, is used most often in small pocket knives), which produces both good strong blade and a sharp edge (it is easy to sharpen too). There are a few more styles of grinding, but these two are the most common of the factory grinds found in both small and large knives. In the long run, look for quality steel that will hold a good edge is easy to sharpen, and resists rust. Also, the grinding style of most blades is not of much interest to the typical user and most are factory applied now days anyway, which leaves you with little choice. However, avoid cheap imported knife blades (usually from third world nations) that are of poor quality, potentially dangerous to use, and are basically useless in the field. Nothing is more frustrating to me than a knife that will not hold or take an edge, or is poorly constructed. The handle of your pocket knife should feel comfortable and solid in your hand. I can assure you, you will not use an uncomfortable knife for a long period of time, unless in an emergency. Rubber and textured handles can give you a better grip in wet or damp conditions, while plastic or composite handles are extremely durable in severe weather conditions. Then again, I like the beauty of natural wood in a handle design. Avoid metal handles in extremely cold weather because the metal will stick to exposed flesh if the temperature drops low enough. Make sure the handle you select is the best one for your intended use and select it for feel and comfort. Once you have your knife at home the work starts. Like all of your outdoor gear, your knives will require frequent attention if you want it to work when you need it the most. Keep the blades of your knife clean and dry, with no fingerprints or moisture on the blades (these can cause stains). Wipe the blades down with a light film of oil or silicon, remembering that most stainless steel knifes can both rust and stain if not cared for properly. Use a soft cotton cloth to do this. Keep the hinged ends of your knife clean and free of pocket debris or dirt. Oil the hinge points with a drop of oil to assure a smooth and easy opening, with a noticeable snap when closing. My grandfather called this the “walks and talks” part of a knife (the blade “walks” open smoothly and “talks” when it loudly snaps shut). Keep the blade sharp, dull blades are dangerous to use because they need more force to cut. If you have to force a knife blade when cutting, it either needs sharpening or perhaps you may need an ax or saw instead of a knife. Never sharpen your blade on a powered wheel, which will raise the heat of your blade's steel and ruin the temper of the steel. Always cut with the blade of a knife moving away from your body. I have seen many injuries result from poor knife usage or a simple slip of the knife. Do not throw your pen knife, multi-blade, or jack knife. They were not designed for throwing. Most of us who travel in nature's back yard would never dream of going out without a good quality pocket knife. There are many different designs, sizes, colors, and types on the market today. If you are like most of us, you prefer a good quality pen knife or jack knife, and now you know what to look for when you purchase your next one. Just remember the number of hinge points you want, the construction of the blade, the number of blades, the type of handle you need, and a few simple safety factors. Picking a good pocket knife is not that difficult, but it does take a little time. I suggest you avoid the cheap, usually imported, models and stick to the better known brands that any sporting goods store can suggest.